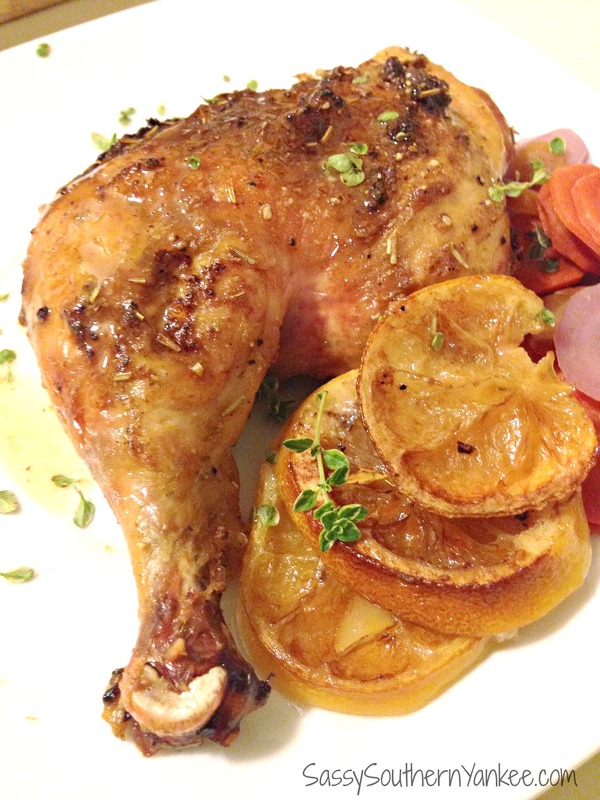 This Lemon Coriander Roasted Spatchcocked Chicken is perfect on those nights when you want to eat healthy, and need something quick and easy to make. I know you’re thinking what the heck is a roasted spatchcocked chicken. Don’t be scared it’s not quite as complicated as you would think and it expedites the cooking time for a whole chicken! A spatchcock, otherwise known as “spattlecock”, is poultry or game that has been prepared for roasting or grilling by removing the backbone, and sometimes the sternum of the bird and flattening it out before cooking. The preparation of a bird in such a manner for cooking may also be known as butterflying the bird. The term “spatchcock” is used when the backbone is removed, whether or not the sternum is removed. Removing the sternum allows the bird to be flattened more fully. 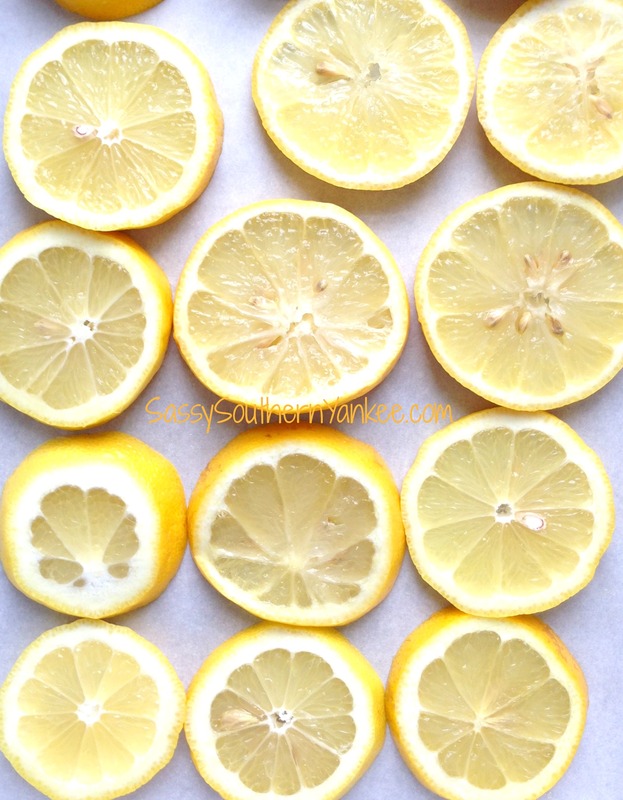 Slice the Lemons so they are about 1/4-1/2 inch thick. Place the lemons in an even layer in a large roasting pan (I lined the pan with parchment paper for an easy cleanup). To make the rub combine the salt, pepper, coriander, rosemary, mustard, garlic powder and olive oil in a small mason jar; shake vigorously until combined. To spatchcock the chicken; place the whole chicken on a cutting board and using a sharp knife or a pair of kitchen sheers remove the backbone from the chicken by cutting on either side. You can discard the backbone or you can keep it and use it to make homemade chicken stock. Remove any excess fat from the chicken; then pat dry with paper towels. Your chicken should now lay flat on the cutting board. Now using your hand or the back of a spoon place about a teaspoon of the rub mixture under the skin over each chicken breast; repeat with each of the chicken thighs. 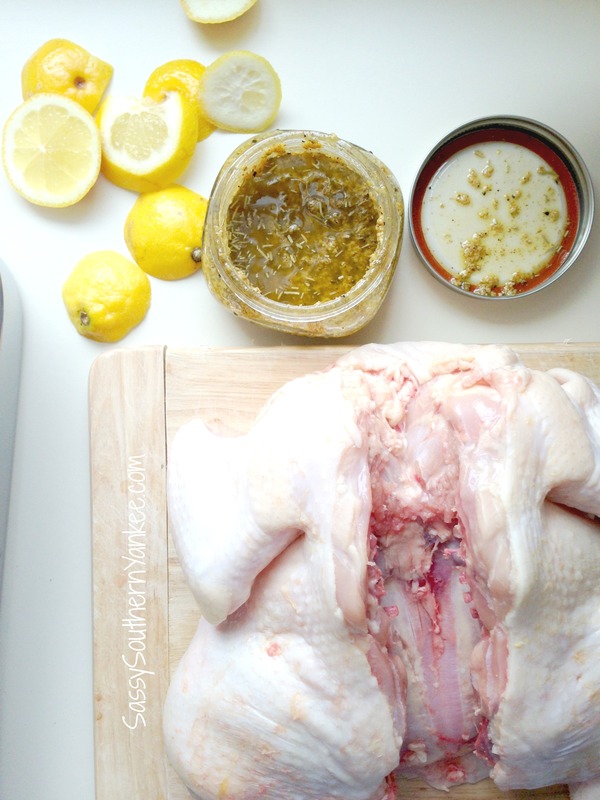 Using your hands put half of the remaining rub on the inside of the chicken; place the chicken in the roasting pan on top of the lemons. Using the remaining half of the rub coat the outside of the chicken ensuing it’s throughly coated. Bake in the oven for 1 hour until golden brown and the juices run clear. Allow to rest for 10 minuets prior to serving, so the juices can redistribute. Serve with the lemon pan drippings and enjoy! I served my Lemon Coriander Roasted Spatchcocked Chicken with multi-color butter carrots and a garden salad. 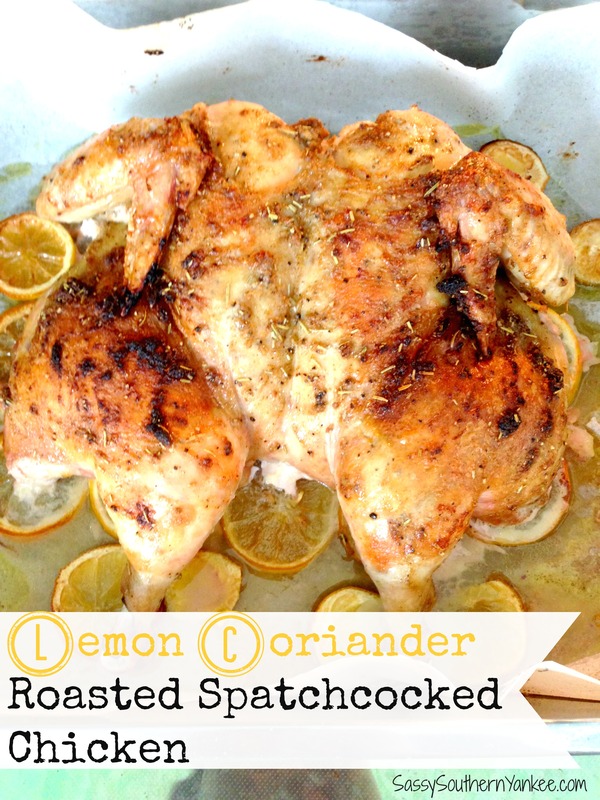 This Lemon Coriander Roasted Spatchcocked Chicken is perfect on those nights when you want to eat healthy and need something quick and easy to make. Slice the Lemons so they are about ¼-1/2 inch thick. Place the lemons in an even layer in a large roasting pan (I lined the pan with parchment paper for an easy cleanup). Your chicken should now lay flat on the cutting board. Now using your hand or the back of a spoon place about a teaspoon of the rub mixture under the skin over each chicken breast; repeat with each of the chicken thighs. Using your hands put half of the remaining rub on the inside of the chicken; place the chicken in the roasting pan on top of the lemons. Using the remaining half of the rub coat the outside of the chicken ensuing it's throughly coated. This entry was posted in Main Course and tagged Chicken, coriander, Easy Dinners, Gluten Free, Healthy Meals, Lemon, Lemon Coriander Chicken, Lemon Coriander Roasted Spatchcocked Chicken, Lemon Coriander Spatchcocked Roasted Chicken, Low Carb, Macros, Oven Roasted, Paleo, quick.